At first, management sounded like they'd be co-operative. But that didn't last. Not long after the union went public, Sturm hired a union-busting firm and fabricated reasons to fire over 15 perceived ringleaders of the union drive. Workers responded with a singing strike, refusing to perform during their shift. Then something quite remarkable happened: the restaurant closed its doors for the day. Not even September 11th or Hurricane Sandy had forced Ellen's bosses to close, but the workers demonstrated that just by staying silent they had the power to bring the restaurant to a standstill. Following the illegal firings, the campaign really heated up. Workers reached out to new hires and rebuilt the union’s numbers. They successfully fought back against the boss’s attempt to make them learn new material in their own unpaid time. They got management to return to proper staffing levels. An unstable piece of stage furniture, which had resulted in worker injuries, was finally replaced. A few months later, Ken Sturm engaged in another round of illegal mass firings. This latest round of firings means that, of the roughly 70 servers who were employed at the time the union was formed, approximately half have been fired. Again, these workers had worked there for between six and 20 years. The National Labor Relations Board has demurred on the union’s request for an injunction. The firings have not stopped the campaign, however. It was after all of these firings that Stardusters staged their most militant action: a twelve-hour strike during the busy Friday evening rush. In a separate job action, workers refused to be filmed by a Brazilian film crew who had struck some kind of deal with management. They spontaneously created a petition and presented it to management on the floor, who was forced to comply. Some of the participants in these actions have only worked at the diner for a matter of weeks. All of this is a testament to how successfully the workers have built a culture in the restaurant of standing up for themselves and each other. The workers have fought back hard with actions that have included fired staff: weekly musical protests, a sip-in (in which union supporters come to the restaurant, leave a nice tip and purchase nothing), phone and Facebook blasts, and targeting other businesses associated with owner Ken Sturm. At one point, management even brought in some outside musicians to try to drown out the sound of the Saturday evening pickets. However, it was discovered that these were union musicians who, after a quiet word, joined in on a few protest songs and shortly thereafter took their leave. Management hasn't tried that tactic since. Recent developments have seen Stardust staff turn away deliveries with their always musical picket lines. 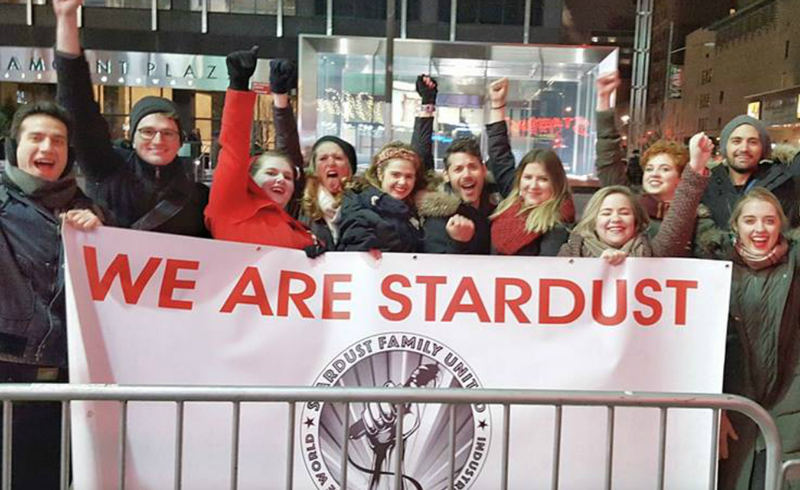 Beyond their regular job actions, Stardust Family United also holds regular “Stardust after Dark” fundraisers and has launched their own Facebook page and website. They've also linked up with other IWW restaurant workers, in particular building a relationship with the Burgerville Workers Union in Portland. The campaign even has its own theme song, written by a member of Stardust Family United and recently covered by Tom Morello as a tribute to the dedication and creativity of the Stardust workers. The Stardust workers understand they're in it for the long haul, despite the unlawful, draconian responses from management. They're determined to keep fighting and keep singing until they've won. Dozens of workers have now been fired and New York is an expensive city, so anything you can spare would be a huge help. Alternatively, why not have your local union branch or political group organize a fundraiser to support these inspiring workers? Not even September 11th or Hurricane Sandy had forced Ellen's bosses to close, but the workers demonstrated that just by staying silent they had the power to bring the restaurant to a standstill. Much respect to these workers, and all those who have supported them. I I love the creative tactics (eg singing strike, musical pickets), and I was really pleased to read about the unionized musicians refusing to help break the strike once they understood the situation. It's a shame that Sturm didn't see that he and the Stardust workers would have all been better off if he'd simply carried on the worker-friendly policies of the previous management. I wonder why he didn't?